Coach "Mac" is known as the "Ageless Coach" - and properly so. He continues to serve as a volunteer football coach at Eureka College at the wonderful age of 95. 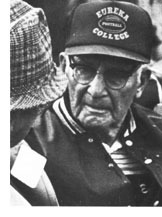 His coaching career started at Eureka College in 1921 where he coached all sports through 1936. 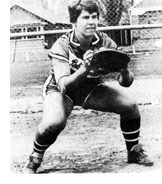 Later coaching positions took him to Wartbury College in Iowa and Northern Illinois University where he became a legend as head basketball and baseball coach. His retirement years brought him home to Eureka and the College he loves so dearly. Helping coach football serves his first love - football - his 68th year coaching the sport. He says, "football is a special game because it provides opportunities for growth in leadership, cooperation, and teamwork - to achieve a goal; it requires sacrifice, self-discipline and hard work." One can't help but think of the positive influence "Mac" has had on so many coaches, players and those he has touched over the years. His best known ex-football player is exPresident Ronald "Dutch" Reagan. They still have a real affection for each other. "He still calls me 'Coach' and I still call him 'Dutch.'" "Coaching is in my blood," McKinzie has said many times. "It hasn't always been fun, but I never lost interest in the game or the kids." Imagine! Sixty-eight years of dedication to one sport. Ralph indeed has made a significant contribution to area sports history.